Family. Brotherhood. 99 percent versus one percent. These are just some of the themes addressed in HELL OR HIGH WATER. And they are all given a thorough vetting without any preaching on the part of the filmmakers. And that makes this film a powerful story, well told and brilliantly executed by David Mackenzie and screenwriter Taylor Sheridan. Chris Pine and Ben Foster are brothers. A bank is about to foreclose on the family’s West Texas ranch and sell it to an oil company. Pine’s Toby has been caring for their dying mother while Foster’s Tanner has been in and out of (though mostly in) prison. They decided to fight the bank by robbing it. Several branches in an ingenious plan to take what they need but keep them off the radar of the FBI. So instead the investigation falls in the laps of two Texas Rangers, Jeff Bridges and Gil Birmingham. There are so many genres mashed up here. Heist movie. Modern western. Socio-political drama. Can the brothers get away with their plan? Will the lawmen get their man? Will the bank get its comeuppance? It seems like it would be a mess. But it totally works on every level. Toby and Tanner have a bond. It’s obvious and Foster and Pine play it perfectly. There is love and caring, but it is only expressed verbally once. The brothers are doing this for Pine’s sons. It is subtle, nuanced and perfect. Bridges and Birmingham have an easy chemistry. Despite the serious themes there is a lot of humor in this movie and most of it comes int he banter between the two Rangers. Is there an actor around that plays lovable and grizzled better than Bridges? As his co-stars have said, he is a national treasure. Pine and Foster are simply great. Pine has never been better and has a career outside summer tentpole films. Bridges eventually figures out what is going on and that leads to one final bank robbery that pretty well goes sideways. It ends in a shootout and chase and lots of bullets and blood, and a bit of brains spilled. There are no heroes here. The Rangers are doing their job but because the brothers are fighting the evil and mostly crooked financial system you don’t really root for them. The brothers are breaking the law but for a noble reason and the criminal past of Foster’s Tanner keeps the whole enterprise morally questionable. Sheridan is a brilliants screenwriter. This is his second feature film, the first was 2015’s SICARIO which was a highly underrated and undeservedly ignored during awards season. HELL OR HIGH WATER proves there is no such thing as a sophomore slump when it comes to real talent. Sheridan meets lofty expectations. I cannot say enough good things about this film except this. 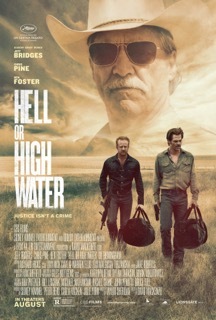 HELL OR HIGH WATER is the best movie I’ve seen so far this year, and second place is not even close.